Whatman 10463401 Polydisc GW Nylon In-line Filters, 4.5 bar Maximum Pressure, 0.45 Micron, 6 to 14mm Tubing Nozzle Connection (Pack of 50) by Whatman at In The National Interest. MPN: 10463401. Hurry! Limited time offer. Offer valid only while supplies last. The Whatman Polydisc GW in-line filter is specifically designed for preparation of ground water samples for the analysis of dissolved heavy metals. 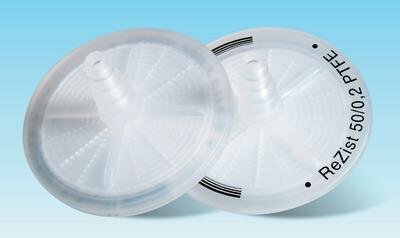 The Whatman Polydisc GW in-line filter is specifically designed for preparation of ground water samples for the analysis of dissolved heavy metals. It is an aqueous filter with low background values for the determination of trace elements. This filter makes the preparation of aqueous solutions for the analysis of dissolved heavy metals easy. It features a large filter surface, quartz fiber prefilter and membrane filter in sandwich arrangement with high soil absorption capacity. It meets all regulation requirements for NEN, EPA. 50/Pack. Whatman #: 10463401. Features a large filter surface, quartz fiber prefilter and membrane filter in sandwich arrangement with high soil absorption capacity.